Its 7PM on a Friday night, and Besito is hopping. A mixed crowd is enjoying the end of the week at one of the finest restaurants New England has to offer. 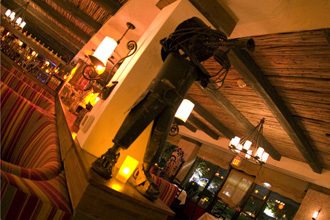 Besito is located at Blue Black Square in West Hartford and has been serving exquisite Mexican cuisine in elegant surroundings since the spring of 2009. Besito, which means “little kiss” in Spanish, is owned by veteran restaurateur John Tunney III, David Tunney and John Reiger. Tunney traveled extensively throughout Mexico, to research not just the food and beverages, but décor too, and it is this that astounds as you enter. The authentic atmosphere is woven together through the use of traditional Mexican design; a dramatic eucalyptus beamed ceiling is combined with vibrant banquettes, authentic wrought iron wall scones and eye-catching art. It is perhaps the lighting that is the most perfect of all. 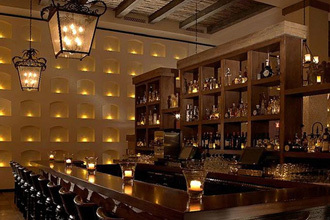 Subdued but not dark, a wall of candles, throws perfect lighting into the room - ideal for a first (or any) date. Our waitress, like all the staff, was attentive without being overbearing, and drinks were served quickly. Allergic to onion, one of our party suggested we order guacamole and chips ($12) while he chose something else, but there was no need - Besito’s guacamole is made fresh at the table. Our waitress sliced open the avocados in front of us before adding the other ingredients and omitting the onion. We opted for ‘medium’ rather than ‘mild’ or ‘spicy’ and it had the perfect kick. It has firm without being hard, and obviously very fresh. 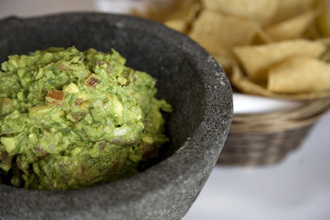 The guacamole was a terrific way to start our meal, as choosing the rest of our food from the extensive menu took some time. As we chatted I took the opportunity to glance around the dining room. Despite every table being full, the bar area packed (the bar is neatly separated from the dining area), and authentic Mexican music being played in the background, it was easy to hold a conversation. No need for raised voices, or lip reading. Acoustics are too often overlooked in restaurants, but this invisible element is vital for a good dining experience and Besito excels. The Salmon Manchamanteles ($23) looked almost too perfect to eat, with its crispy banana garnish. Almost. 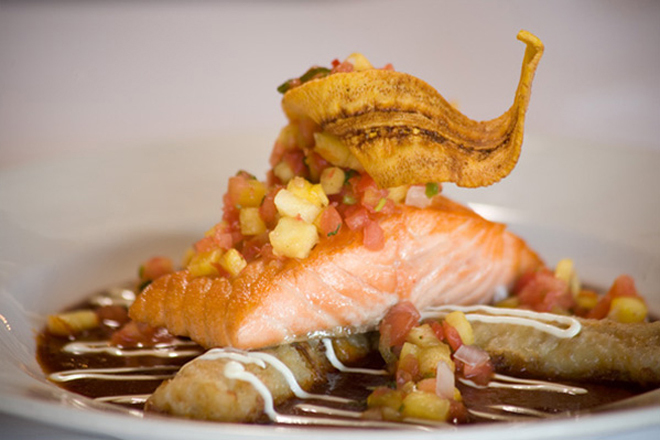 The salmon was roasted to perfection and sat atop four cooked bananas, which lay in mole manchamanteles. The pico de gallo added just the right amount of heat, and the pineapple added its own unique touch to the dish. The distinct tastes blended into a sensational whole. Tunney’s extensive travels were well worth the time if only for this one mouth-watering recipe. The Pechuga de Pollo ($19) consisted of a moist Yucatan spiced chicken breast, that was served with crispy rolled taco’s filled with fresh cheese, sautéed squash, and zucchini, around which was pipián verde (also known as mole verde). The vegetables were perfect and the pumpkin seeds in the verde sauce complimented the chicken extremely well. The side dish of plantains ($5) was delicious, and was gone all too quickly. Of the desserts (all $7) two in particular were standouts. The Cupa de Fressas – fresh berries with mango cream - was spectacular. The mango cream (ingenious!) lifted this light dish and was truly sublime. The Budin de Chocolate is a smooth, rich chocolate pudding with a dollop of fresh cream. It is served with deliciously decadent small fried flour tortillas that have been lighted tossed in cinnamon and sugar. Besitos has Mexican dishes that you won’t find anywhere else in New England, and its excellent reputation is well deserved. Should you find yourself in either Huntington, NY or Roslyn, NY check out their other two locations – full details of which are on their website. All images were kindly supplied by, and are copyright, Besito.